We were trying to put off pulling the cattle out of the wooded side of our property and putting them in the pasture. 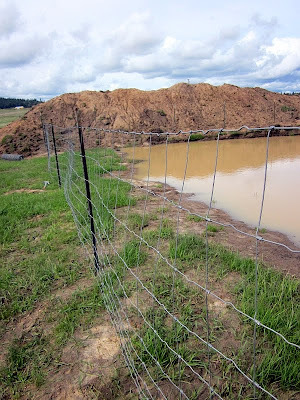 The reasons for this were two-fold: One, we wanted the pasture to grow up a bit more with grass; and two, the pond was still unfenced. 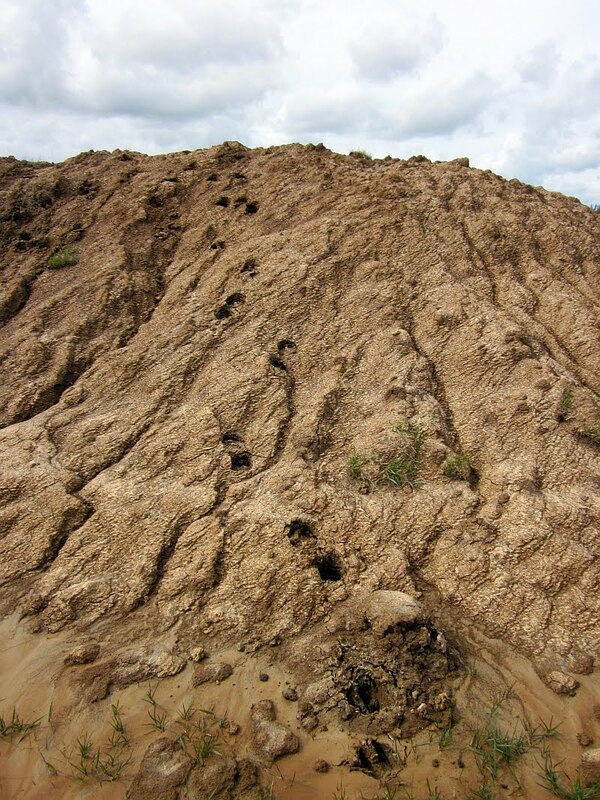 We had the vain hope that the ground would dry out enough that a friend who wants the dirt could come and get it. But no such luck. The cows were getting ornery and hopping fences onto neighboring land (where the grass literally was greener). We were still feeding hay (and in fact buying more) because we were out of the hay we put up last year. So, bottom line, moving the cows was unavoidable. It also turned into a big pain in the patookus. 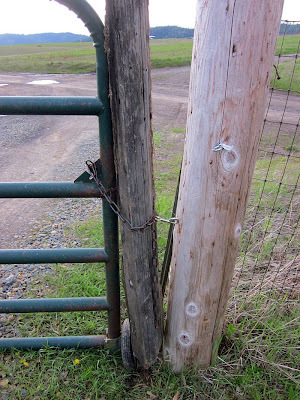 Our first mistake was we forgot to check and make sure the gate at the bottom of the pasture -- the one connecting with a neighbor's land -- was closed. It wasn't. I don't know why, but it wasn't. 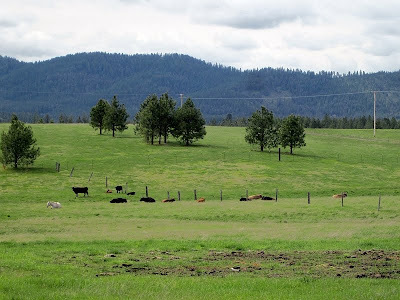 Next thing we knew, all the cattle had poured out onto the neighbor's side. So we cobbled a temporary post onto the gate just to keep him from squeezing through. We'll do it up properly soon. 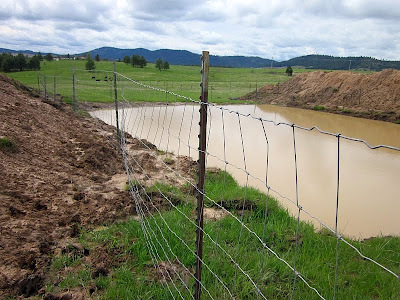 And naturally, before we could move the cows, we had to get the pond fenced. Cows aren't too bright at the best of times, and if they fell into this pond they may not be able to get out again. So we installed a temporary fence around it. Evidently with good reason. 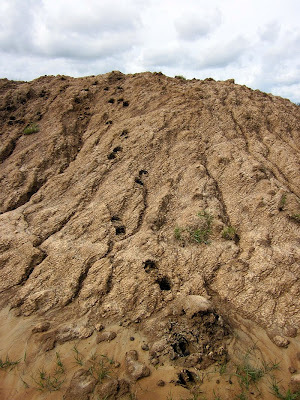 Here's a series of hoofprints from a curious bovine, climbing one of the dirt mounds. Good thing that fence was there -- can't have these guys sliding into the water! On the other hand, once everyone settled down, they sure have enjoyed all that green grass. I could just hear them mooing, "Freedom!!" This is not a permanent (as in, all summer long) arrangement. 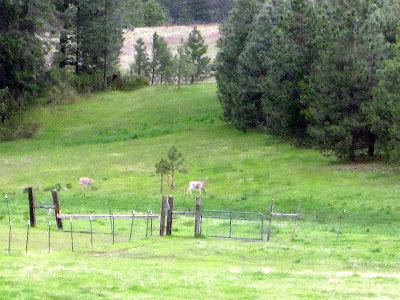 We're just gonna give the wooded side of the pasture a chance to grow up some more, then we'll shoo everyone back into the woods so we can let the pasture grow some more. And late in the summer (early Fall, actually) we'll open the gate onto our neighbor's side and let the cattle graze his land down for about two months (we lease the land for that time). Critters it seems can always find a a way out even when you don't think there is. In my case it is one chicken that can get out of the pen with a 6 foot tall fence and her wing clipped. I have fixed every place I can find but somehow she still gets out every morning... Beaming out I guess..... ;o) Wish I could find the transporter console and turn it off!!!! Don't you just love moving cattle. I sold one cause she would break from the herd and cause all kinds of chaos. The next time I got her in the corral the only way she got out was in a trailer on the way to the auction. They do have minds of their own! The little buggers. Don't you just love the word 'temporary'? It is an all too frequent word in ALL my projects.